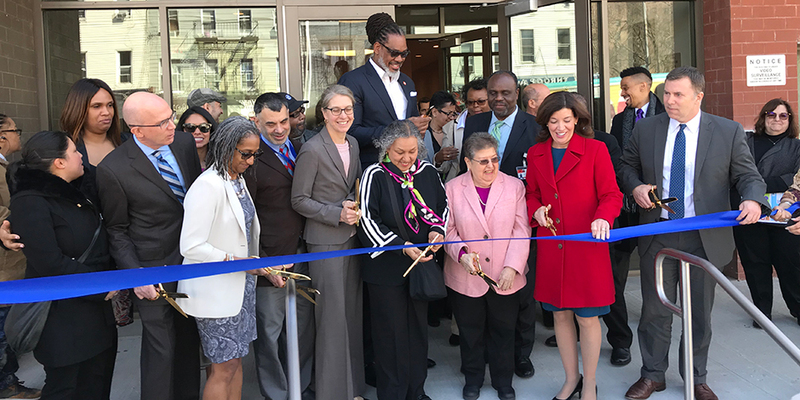 Comunilife, one of New York City’s leading not-for-profit organizations that develops supportive housing for people with special needs, today held a ribbon-cutting ceremony to open a brand-new 89 unit supportive and affordable housing residence in Brooklyn’s Bedford-Stuyvesant neighborhood. The residence, named Woodhull Residence, is located at 179 Throop Avenue, in what used to be a parking lot on the campus of NYC Health + Hospital’s Woodhull Hospital. The building includes 54 studio apartments for formerly homeless adults with living special needs and 35 studio apartments for low-income community residents. Designed by architect Monica Lopez, the building meets Energy Green Communities standards. The six-story building also features a community room and computer lab on the first floor, plus on-site case management and social services and 24-hour security. Funding for the $28.8 million project was provided by the NYS Homes and Community Renewal (the State’s affordable housing agency), NYC Department of Housing Preservation and Development (HPD), Hudson Housing Capital, who provided the Low Income Housing Tax Credits, and JP Morgan Chase, are among other partners. The rental subsidies and service award are provided by the NYC Department of Health and Mental Hygiene. Following remarks and formal ribbon cutting by Dr. Gil, local elected officials and development partners, tours of the building and reception followed. “I thank you all for having the vision to convert this parking lot into a place of new beginnings. We are very proud to celebrate here today, to give 89 individuals an opportunity to have a roof over the heads, no longer have to shiver in the night, wonder whether or not they’ll be safe, whether they’ll wake up next morning. This is what we do as human beings, we take care of each other,” said New York State Lieutenant Governor, Kathy Hochul. Gregory Calliste, CEO of NYC Health + Hospitals/Woodhull, expresses his gratitude: for this Comunilife Housing Project at Woodhull which will provide permanent housing relief to 89 mental health and low income residents of the Woodhull community; to Comunilife as our trusted partner and sponsor of this important project that has been completed on schedule and on-budget; to NYC Health + Hospitals and the City of New York for fully supporting this initiative; Woodhull Hospital community for embracing and supporting this project. Housing is critical for one’s stability, and this project will help 89 residents and their families in achieving stability, security and independence. Thanks you to all who made this possible. Also present in today’s ribbon cutting ceremony were the projects partners including representatives from JP Morgan Chase, Hudson Housing Capital, CSH, Metroplus, Comunilife’s Board of Directors, among others. With the opening today of the Woodhull Residence, Comunilife now provides 1,992 units of supporting and affordable housing units citywide. Founded in 1989, Comunilife’s mission is to provide vulnerable communities with housing and culturally sensitive support services. Celebrating its 30thanniversary in 2019, Comunilife believes that no one should be without the housing and supports they need to lead a healthy, meaningful life. In addition to providing affordable and supportive housing, Comunilife’s programs include a medical respite program for hospital patients who are medically cleared for discharge but do not have a stable home in which to finish their recuperation and Life is Precious™, a suicide prevention program for Latina adolescents. To learn more, visit us at Comunilife.org and stay connected on www.facebook.com/Comunilife/ or Twitter @Comunilifeinc.